The Detroit Red Wings did not have a good night on Saturday. They were blown out by a final score of 7-2 in a matinee game at the Joe Louis Arena and subsequently waved goodbye to playoff security. They have seven games to go this season and will have to win at least five of them to secure a post-season berth. If they miss the boat, it’ll be the first time Detroit has missed the playoffs in 24 years. That’s the longest playoff streak of any team in all of the major North American sports leagues. The Red Wings have 85 points currently. That ties them with the Philadelphia Flyers, who have eight games to go, and puts them four points back of the New York Islanders. The seven goals Detroit allowed by the Pittsburgh Penguins on Saturday afternoon represented the most goals the team’s allowed this season. 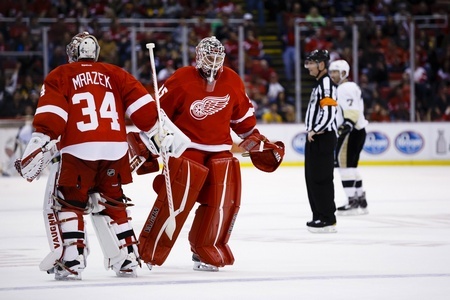 The fans booed the Red Wings and Petr Mrazek was chased from the goal. The Penguins came out firing and exposed a hockey club with a clear weakness. They got several easy chances on target and uncorked four shots on goal in 90 seconds. Phil Kessel and Nick Bonino had big nights for Pittsburgh. The loss was tough and maybe even represented the beginning of the end, but general manager Ken Holland still believes in his franchise – and rightly so. This is a club that’s been able to move through many phases of its storied history, including the departure of key players like Nicklas Lidstrom, Steve Yzerman and Brendan Shanahan. They’ve overcome adversity, like when the salary cap was supposed to iron things out in 2005-2006. And now they’ve turned into a scrappy crew that has to fight for a chance to dance. That’s not necessarily the position Detroit’s fans want to find their beloved Red Wings in, but it’s the way it is for the time being. The team was 25-16-8 at the All-Star break and the playoffs seemed a sure thing. Since then, they dropped to 12-10-3 and lost ground to the surging Flyers. Their offence is 22nd overall, with Henrik Zetterberg on pace for his worst totals since his rookie season and Pavel Datsyuk coming up short as well. And the power play is 18th overall, a significant dip from their second-best man-advantage last year. The Red Wings could make the playoffs. They aren’t mathematically eliminated. But they’ll need to pull things together and find their groove under head coach Jeff Blashill. And if they can’t, history will be made for all the wrong reasons.